You are at:Home»Herbs»Pistacia vera Linn. Latin name : Pistacia vera Linn. Description : The kernels are considered to be cardiac tonic, cerebral tonic, demulcent, digestive, sedative, spermatogenic, stomachic and tonic and contain a melting fatty oil. Useful in debility. Recommended Dosage : 3 to 5 g fruit. 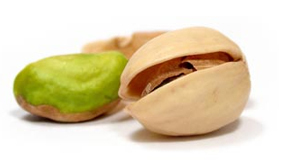 Contraindication : Persons allergic to tree nuts should not use Pistachio.